The Galaxy Audio DS-SP36 is a 3 in 6 out Speaker Management System. 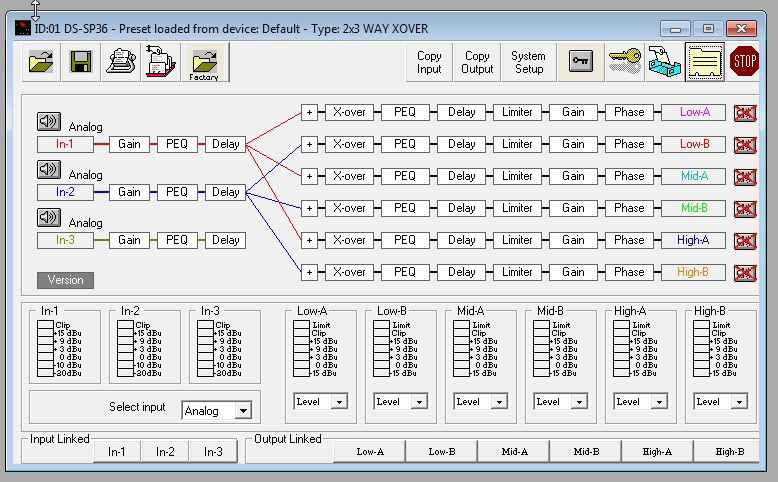 Each input can be easily assigned to each of the 6 outputs. The system includes Gain, 5 band parametric EQ, and Delay on each of the 3 inputs, as well as, on each of the 6 outputs, which also feature high and low pass filters for crossover use, limiters, and polarity reversal. Additionally, each input and output can have your own choice of name assigned to it. The DS-SP36 gives the user access to a powerful array of Xover, EQ, Delay, Limiter, Gain, and Polarity controls to help maximize your loudspeaker system. 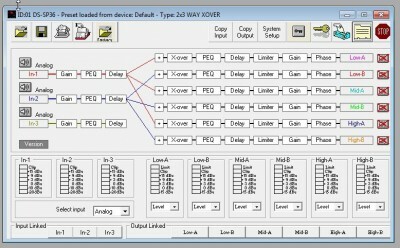 Up to 24 presets can be saved. The DS-SP36 can be configured to have any input go to any out. This provides great versatility, giving many choices such as stereo 3-way, 3x2-way, stereo 2-way with sub and delay fill, etc. The DS-SP36 provides you with all the tools needed to best utilize your sound system. Input and Output delays up to 850ms, with steps of 1msec and 21usec.